Cathie Rowand | The Journal Gazette People protest Republican efforts in Congress to repeal and replace the Affordable Care Act during a Tuesday demonstration outside the E. Ross Adair Federal Building and U.S. Courthouse. 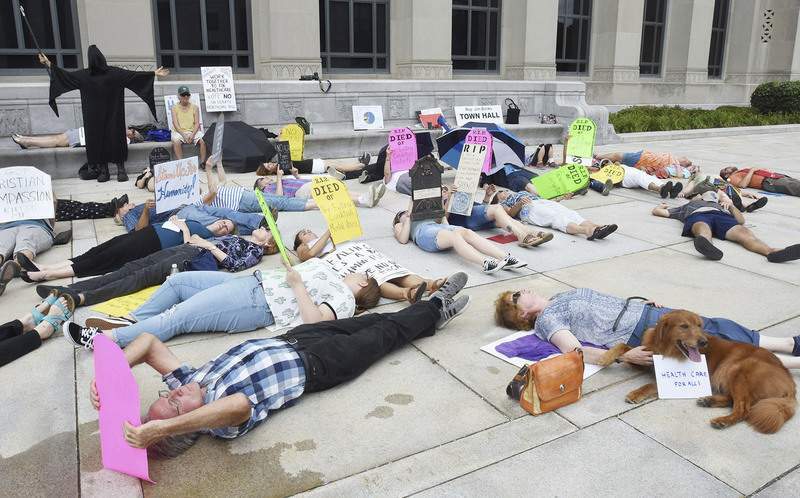 Cathie Rowand | The Journal Gazette Demonstrators stage a "die in" Tuesday outside the E. Ross Adair Federal Building and U.S. Courthouse to protest Republican efforts in Congress to repeal and replace the Affordable Care Act. Forty people played dead for a minute outside the E. Ross Adair Federal Building and U.S. Courthouse on Tuesday. Holding paper replicas of tombstones, they lay down on the plaza in front of the downtown building to silently protest Republican efforts in Congress to repeal and replace the Affordable Care Act. Rowan Greene, dressed as the Grim Reaper, walked among the reposing crowd. 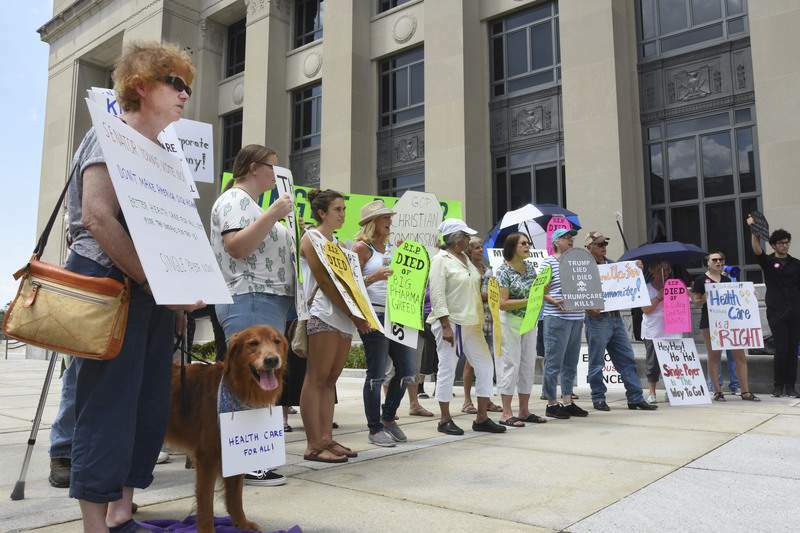 Their demonstration – organized by Indivisible, Fort Wayne Liberation Movement and United Activists of Fort Wayne – was aimed at a tenant of the federal building -- Sen. Todd Young, R-Ind., who has not said how he will vote on the Better Care Reconciliation Act. That legislation seems as dead as the demonstrators pretended to be. Four GOP senators have announced their opposition to the bill, two more than Republicans could afford to lose in a chamber where they have a 52-48 majority and Vice President Mike Pence as the tie-breaker. "We did kill the bill," Dr. Alison Case, a family medicine physician, announced to cheers at Tuesday's demonstration before the "die in." "Now we have an even scarier thing coming toward us.... (Republican lawmakers) are looking to repeal the ACA without a replacement plan, which doesn't make any sense, right? "We're here today to say that the only true replacement is single-payer, something that covers everyone," Case said. "We've got a great system -- Medicare. It works," Dr. Thomas Hayhurst, a pulmonologist and former member of the Fort Wayne City Council, said about the federal health insurance program for people 65 and older. "It's been refined multiple times over the last 40, 50 years. We need Medicare for all." The demonstration was among four scheduled outside Young's offices in Indiana. They were part of a nationwide Kill the Bill Day of Action led by the progressive activist group Indivisible. Young "is listening to the opinions of all Hoosiers," Jay Kenworthy, the senator's communications director, said in an email. 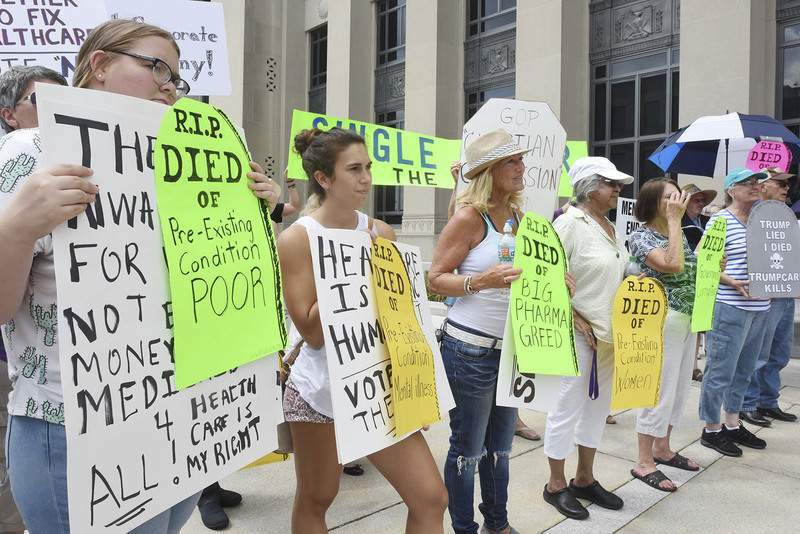 The consensus among speakers at the Fort Wayne demonstration was that Young and Congress should pursue universal health coverage. "For the sake of the common good, we must continue to fight to make progress toward a United States health care system that is inclusive, equitable, affordable, accountable and accessible for all people," said Christen Pettit Miller, pastor at Peace United Church of Christ. Susan Catterall of Hamilton, the mother of two adult children with autism, said people with disabilities are at risk of losing medical care if Congress curbs state Medicaid expansions created by the Affordable Care Act. She said Indiana's expanded Medicaid program, known as Healthy Indiana Plan 2.0, has drastically cut the waiting time for people enrolling in home services for autism and developmental disabilities. "This is the United States of America. We are capable of taking care of the disabled, the poor and the elderly," Catterall shouted to the crowd. Brian Flory, pastor of Beacon Heights Church of the Brethren, said: "Regardless of what you may have heard the last six months, health care is not a political issue, it's not a fiscal budgetary issue. It's a human being issue. It's also a faith issue." Flory also said: "I've not met anyone yet who believes the Affordable Care Act is perfect. But the answer is to work together to improve coverage and to ensure quality health care for everyone." He said he obtained medical insurance through the Affordable Care Act, "so this is personal for me." The event poked at Rep. Jim Banks, R-3rd, for voting in favor of repeal-and-replace legislation that passed the House in May. 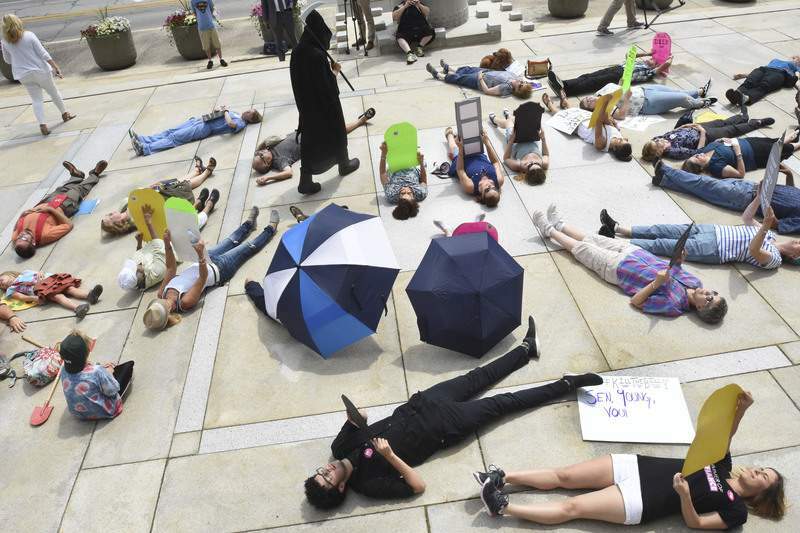 A man wearing a sign bearing Banks' name joined the Grim Reaper on the federal building plaza as Case stated that Banks had "made a deal with death" by supporting the American Health Care Act. Banks wrote Tuesday on Facebook, "I am committed to fulfilling the pledge I made to my constituents to repeal Obamacare. Congress should immediately consider the repeal bill it passed in 2015, which will allow time to work on a replacement plan that delivers on the failed promises of Obamacare by eliminating crushing regulations, lowering costs and improving choice." The Affordable Care Act is also known as Obamacare because it was championed and enacted by then-President Barack Obama. The law requires most Americans to carry health insurance, provides income-based subsidies to help pay for it and requires insurers to cover pre-existing medical conditions.